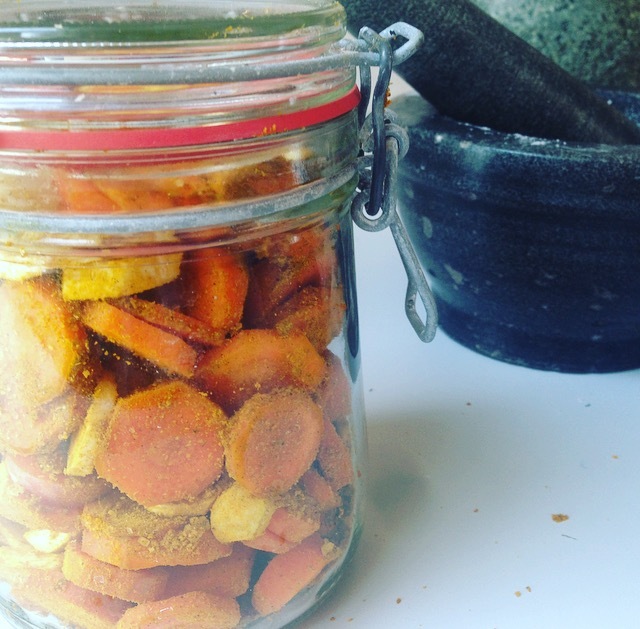 Try Dry Fermenting – Carrots! 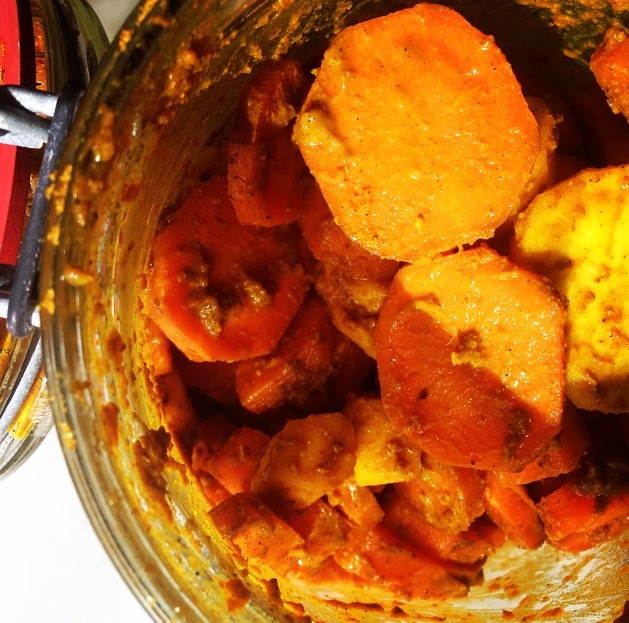 Try a Dry Ferment – and dont forget to SHAKE SHAKE SHAKE! 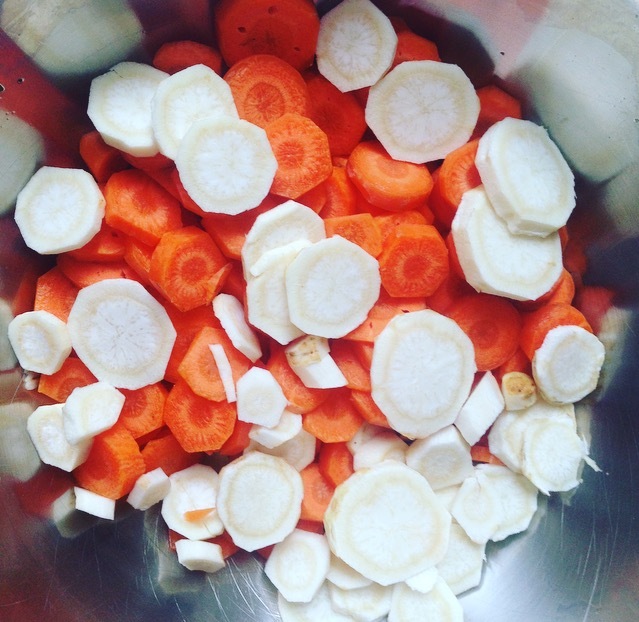 ​ ​Vegetables such as carrots, beets, parsnips and kohlrabi are hard to massage water out of when cut into large peices rather than grated. Often we add a brine (salty-water) in order to ferment these veggies – but here we try something else – and over days with a salty-shaking method, pull those juices out and get a strong un-diluted flavour! BAM! One of our Alchemists’ had messaged me pictures of their ferment experiment and i decided I too must try a DRY ferment as the pictures of coated, flavourful carrots looks way too tantalizing. A dry ferment is when we are using vegetables that we can’t easily get much water out of when squeezing like one can with cabbage, and so we often resort to making a brine to cover up the hard vegetables. Instead, here we use a shaking method over days with salt to slowly draw out the water in the hard vegetables and create a thick and flavourful coating only with the natural juices in the vegetables. 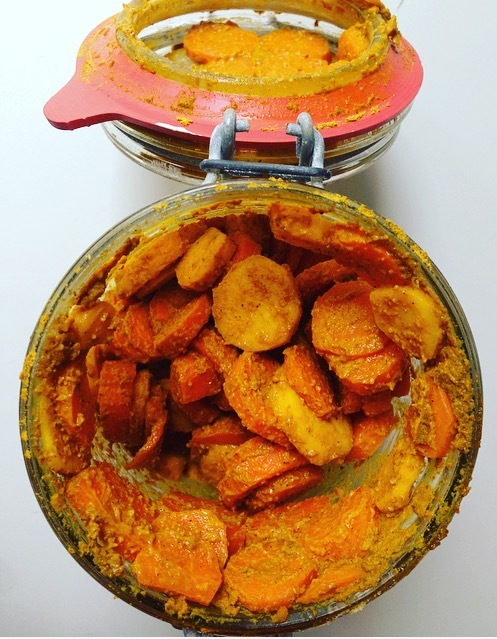 INGREDIENTS 1kg carrots sliced (and/or parsnips) Tablespoon of turmeric 1/2 teaspoon of chilli 2 teaspoons of salt Rub all of the above together then leave in an bowl for half hour so the salt starts drawing out the moisture of the carrots before packing it all into a one litre jar. The spices and brine will form a thick sauce that with daily shaking will ensure it gets evenly coated over the veg. Put the jar somewhere in sight so every time you walk past give it a shake! The whole process takes about 7 days with regular daily shaking in a sealed jar. 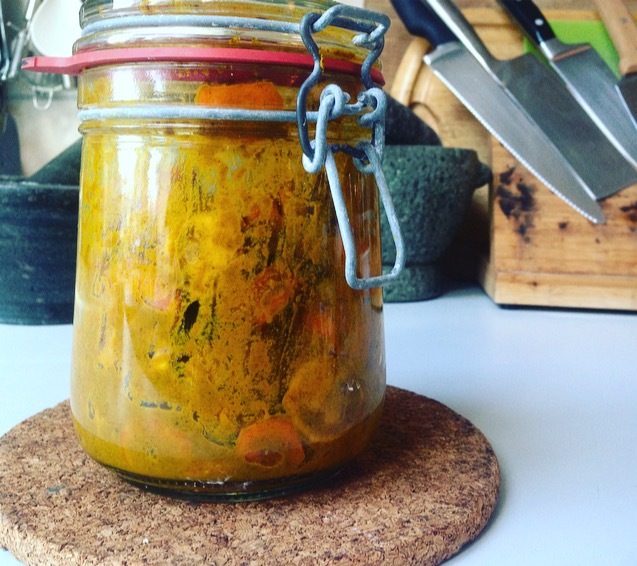 You don’t have to over-pack the jar like you might do with sauerkraut, just let the salt draw out the moisture and the turmeric and chilli control the fermentation. There should be a delightful fizz on opening and tangy, pickled, turmeric-y taste. Try these babies on fresh sourdough. This is super interesting! I’ve actually never heard of dry-fermenting – and I’ve been doing a bunch of research on fermentation lately because I’m getting ready to dive into the deep end and try it for myself! I have previously just purchased any of my pickled or fermented stuff from the grocery store, but I think its time for me to invest in making it myself at home! I’ll save money, and save the trip to the store! Is there a noticeable difference in flavor between the vegetables when you ferment them dry vs wet? I am curious how they pair up and if you would use them in the same types of dishes. Thank you for sharing! when you say in a sealed jar, do you mean airtight (ie; as in canning)? yes, canning jars are perfect for this. however its also important to release the pressure built up from the fermentation (i.e. burp it once in a while during the first weeks). Any idea if this is better or worse probiotic wise than brine fermenting? I am using ferments to help heal my gut so this is important for me. 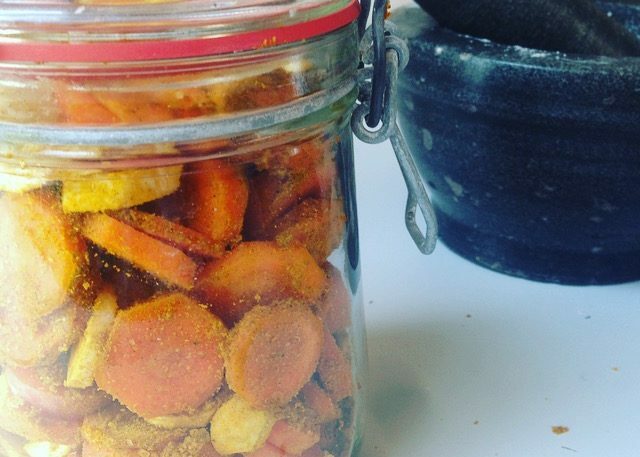 i would say brined veggies pack even more probiotics in there as they allow more time for fermenting, and dry ferments are finished and consumed a bit earlier, thus not as many probiotics build up as a slower process. however as we havent been able to test this, we dont have the exact quantities of probiotic statistics available, YET! this ferment, i use mainly for a super concentrated flavors and it works as a good pickling technique. after shaking, one can put in a smaller jar, reduce the air and allow the ferment to continue and ripen and gain even more lacto-bacillus ! But this isn’t dry fermenting, it’s not even dry is it? It looks like the same process is happening that happens when you make traditional sauerkraut. In traditional sauerkraut you salt the vegetable and squeeze the juice out of it but instead of squeezing the vegetable you are shaking it in the jar.